One person has been taken to hospital after a fire at a house in Muir of Ord. The emergency services were alerted to the blaze at 23:50 on Sunday. Five appliances from the Scottish Fire and Rescue Service tackled the fire in Logan Way. The house has been destroyed and the property next door badly damaged. 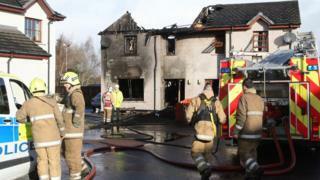 Police Scotland said the fire was not being treated as suspicious.